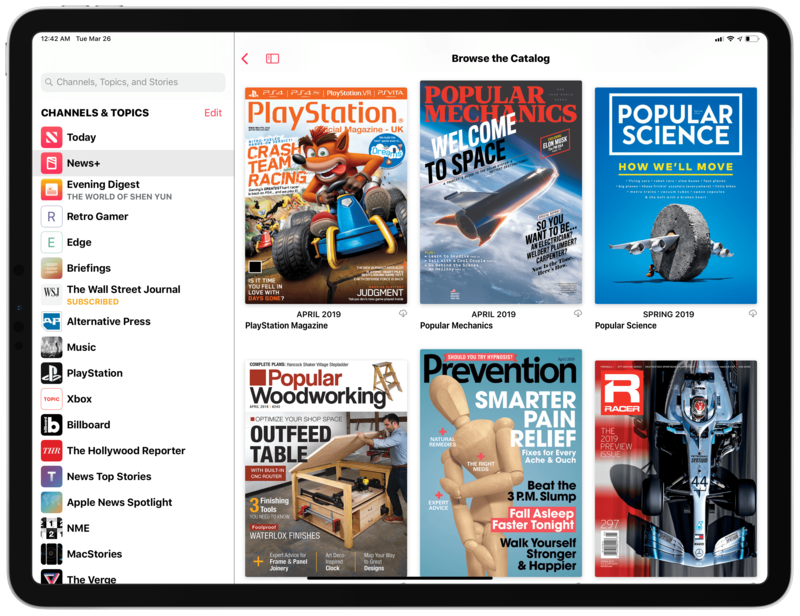 Earlier today, Apple launched Apple News+, a new subscription-based service to gain access to hundreds of magazines in the Apple News app for $9.99/month. You can read my overview and first impressions here. After taking an initial look at Apple News+ with my US Apple ID and noticing the differences between Apple News Format-optimized magazines and standard "PDF-like" ones, I thought it'd be interesting and useful to compile the full list of all magazines currently available to Apple News+ subscribers in the US. These are only magazines. I didn't count newspapers (The Wall Street Journal and Los Angeles Times) and digital publishers. Apple News+ just launched. Some magazines may not have gone live yet. In fact, I had to add a few more right before posting this article. To create this list, I manually opened each magazine and annotated whether its latest issue was using Apple News Format or the standard, PDF-like format. Magazines that support Apple News Format are labeled with "(ANF)" in the list. The split between Apple News Format magazines and standard magazines is fairly even: 125 magazines are using the richer Apple News Format in their latest issue, while 126 of them are relying on traditional PDFs (likely the format the old Texture service was using). In simpler terms, this means that 49.8% of the magazines I counted in this list are using Apple News Format. As I wrote in my overview earlier today, I hope more and more publishers will switch to the mobile-friendly, more versatile Apple News Format in future issues. That being said, you can find the complete list of 251 magazines I found in Apple News+ below. If I missed any, please let me know.